Paul Fromont concedes that the recent "resurgence" of Calvinism "is needful for many, but I'm not convinced (on a wider front) that it is a way forward into uncharted territory and the missional questions that are being thrown up in these Post-Christendom times." Marilynne Robinson on total depravity. Phil Johnson addresses God's love for the world. David Mathis writes, "If you want to know God, then get to know Jesus. His person and work are God's final and decisive message (Word) to sinful humanity." 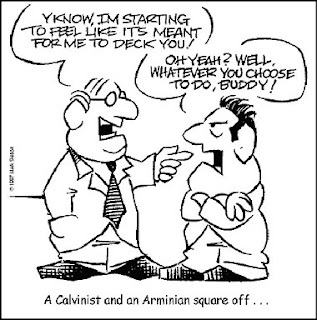 Paul T. McCain thinks Calvinism is a "dreary business." He says, "Calvinists are constantly having to explain to people why when God's Word says, 'God so loved the world' it doesn't really mean 'the world' and why when God's Word says, 'Christ died for all' it doesn't really mean 'all.'" We're also constantly having to explain to people why it's important to read scripture in context. Bradley Cochran thinks we can expect to hear more anti-Calvinist rhetoric. David Jordan admits he has "grown a bit calloused to Arminian straw men." Still, he answers one pastor's 95 Theses condemning Reformed theology.